At first glance the sight of 'lists' tends not to arouse the average person's curiosity and certainly the discovery of a small selection stashed away amongst far more visually exiting documents, drawings and photos was not a particularly memorable moment in my research! However, they were dutifully copied to the computer and there they have remained taking up memory space. 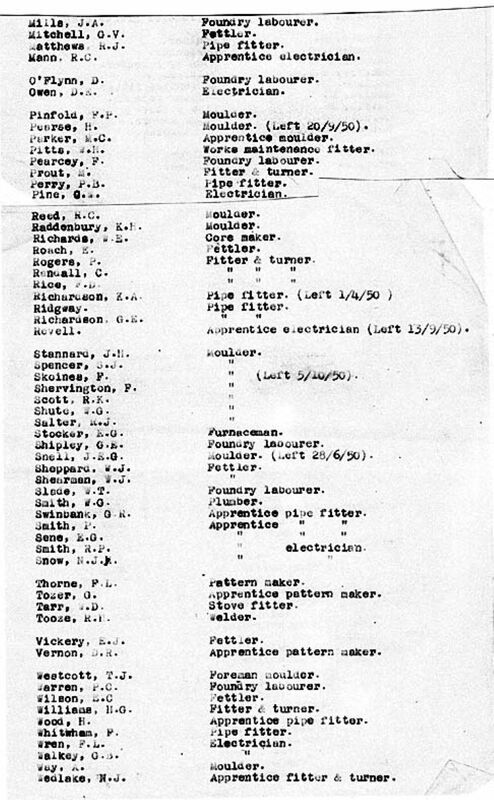 Searching for material for another webpage I by chance came across one of these lists and I have reproduced it below for all to examine. I think it was the page entitled "Office Staff" that attracted my attention - after all it is unusual to see, at the top of the list, the Office Cleaner! - I know, a list has to begin with something on the top. Curiously it should be Adams, W.J. at the top - not Mrs Anderson, I might have skipped it had that been the case. 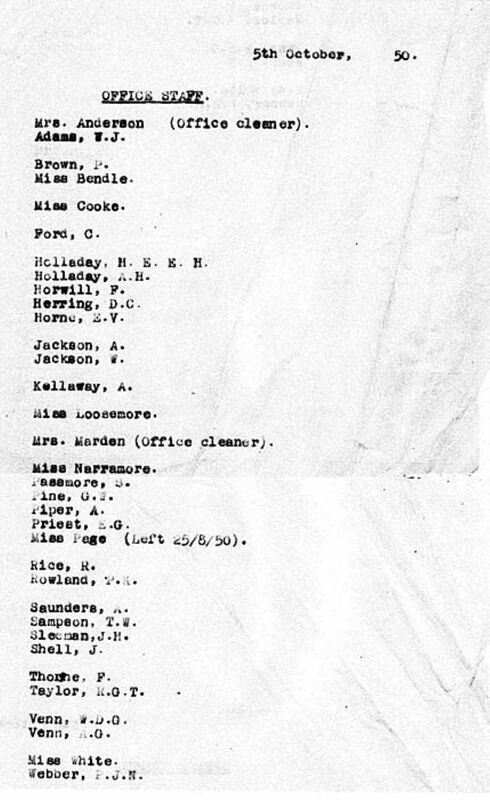 Here we have a complete Nominal Roll of the Workforce of Garton & King on the 5th October 1950 - not only the names but in many cases what it was they were employed to do, even now sixty years on there will be names people will recognise and perhaps identify a family member. I was only five at the time and have never worked for G & K but familiar names are there - Jackson - Venn - Miss Bendle, Tarr, & Cavill. 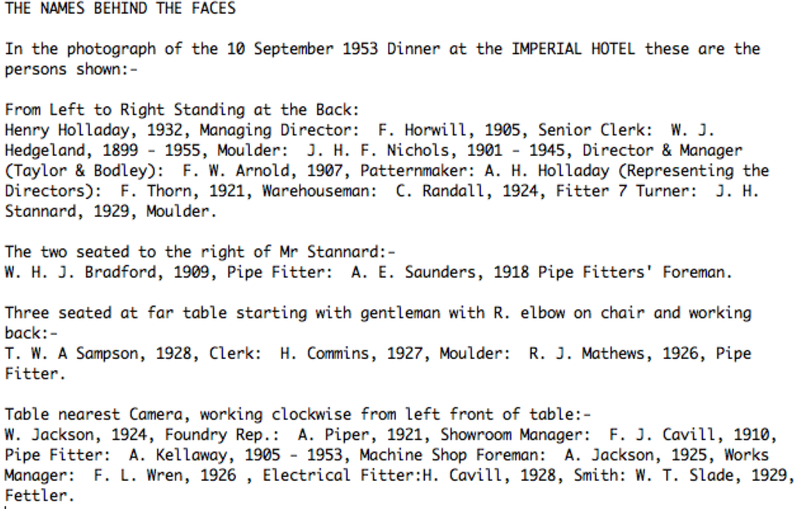 Realising that there might be other Lists that are Jewels of Information I have included here a Timesheet for the Foundry Staff dated July 1928. 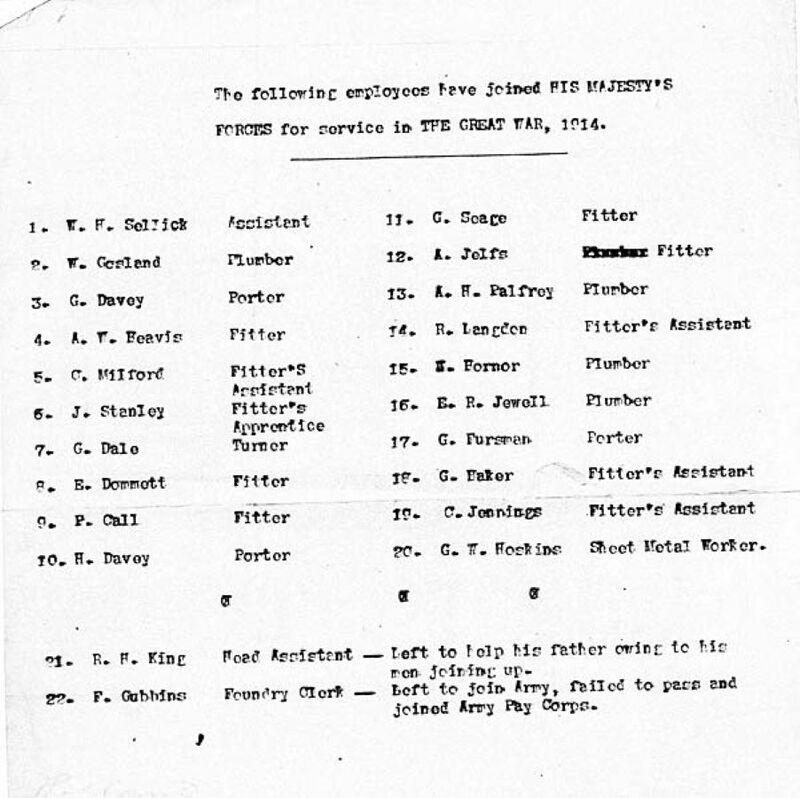 Another gem I discovered was a list of employees who had enlisted into His Majesty's Forces in the Great War, 1914. 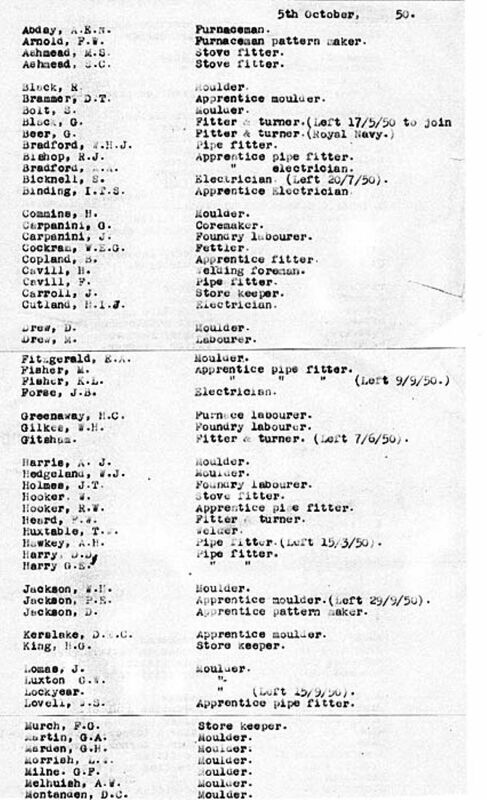 I also came across a list of Staff Members dated 4th May 1944, their addresses and their wartime duties, ie: Home Guard, Auxiliary Fire Service, Warden etc etc. 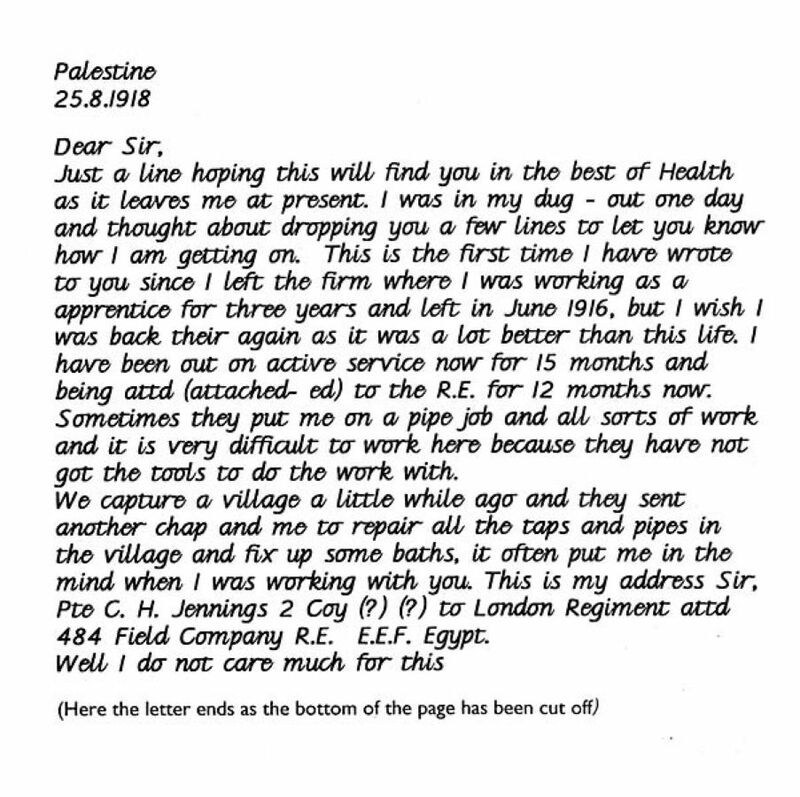 One item I discovered was unfortunately too feint to reproduce so it has been retyped exactly from the original "Letter from Palestine". 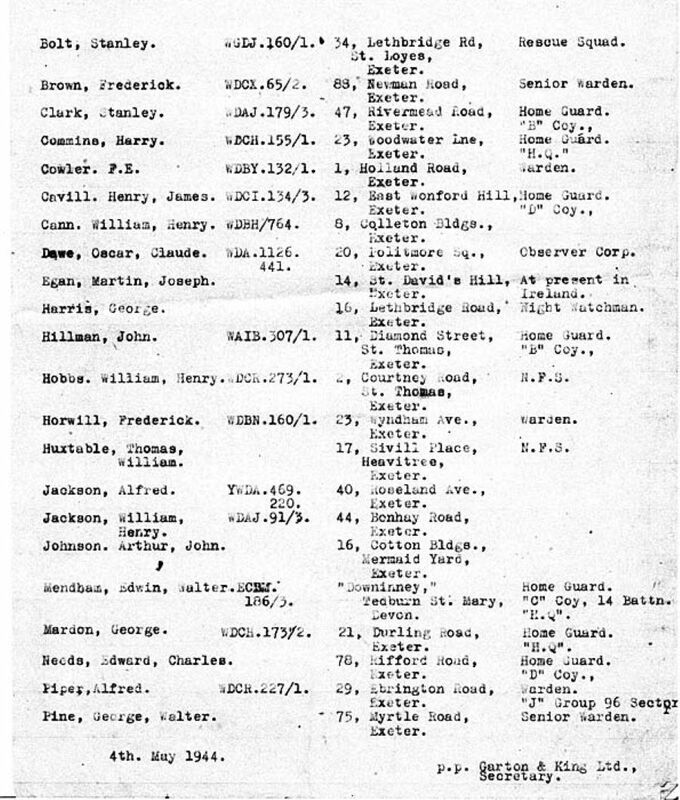 Men who enlisted - 1914. 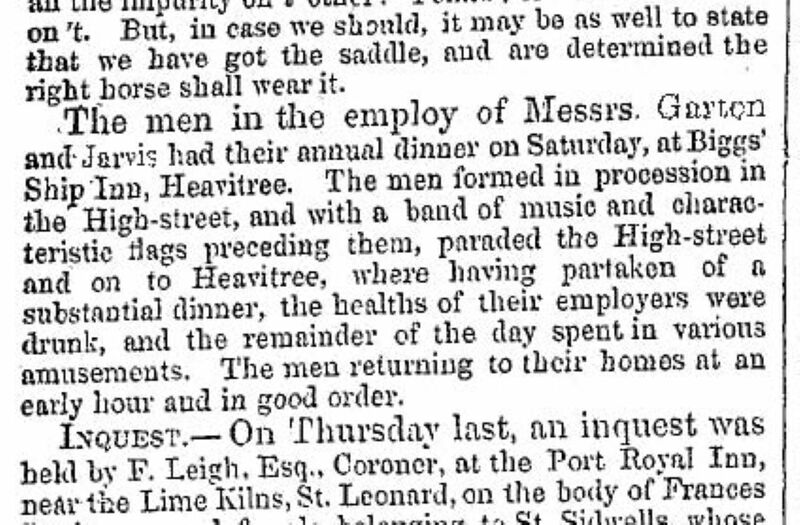 The first mention of Staff jollification and possibly raucous behaviour was reported in the Trewman's Exeter Flying Post on the 5th September 1850 - although the report implies it all got off together with a good send off from High Street it seems the whole company completely failed to come up to traditional standards set by Works Dos and all retired home in the early hours "In Good Order" without so much as a whimper! 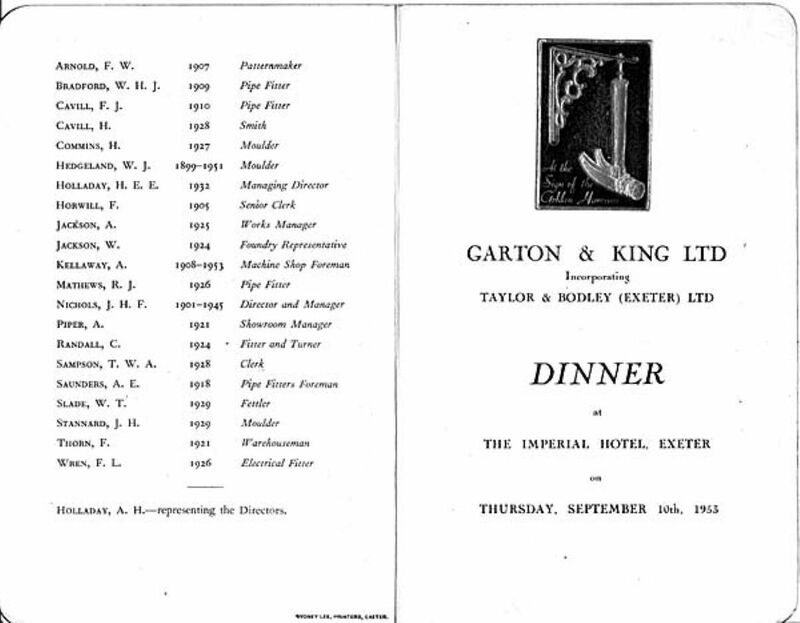 Hopefully, with the name changed from Garton & Jarvis to Garton & King the next record of a big shebang might have shown a change in behaviour; unfortunately it seems that the next "Do" that I can find any mention of was just over 100 years later at the Imperial Hotel, Exeter. An attempt by the Exeter Magical Society presumably failed to stimulate those present enough either to wreck the joint or even wake the neighbours when they left! 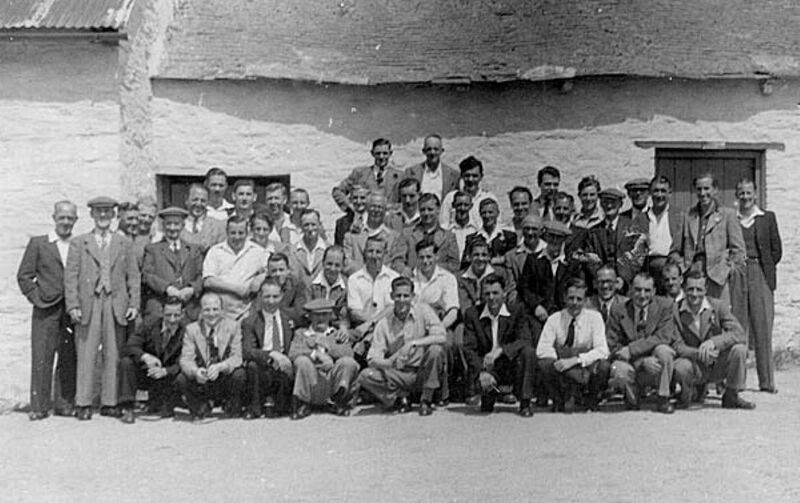 Thanks to George E Commins of East Grove Road, Exeter we are able to show a photograph of a Works Day Trip to Looe & Polperro - the photo was taken at Ashburton; quite when is uncertain though he tells us that the Works Outings were always in August. 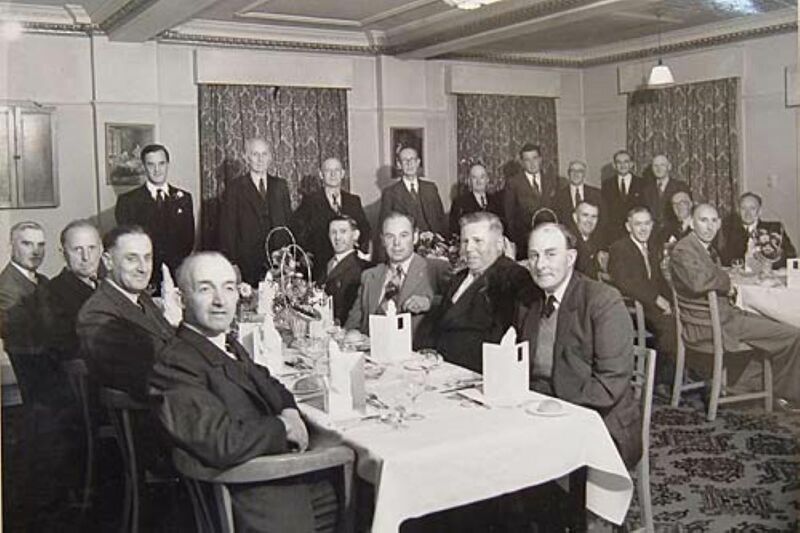 He has been able to identify some of the workforce in the picture. 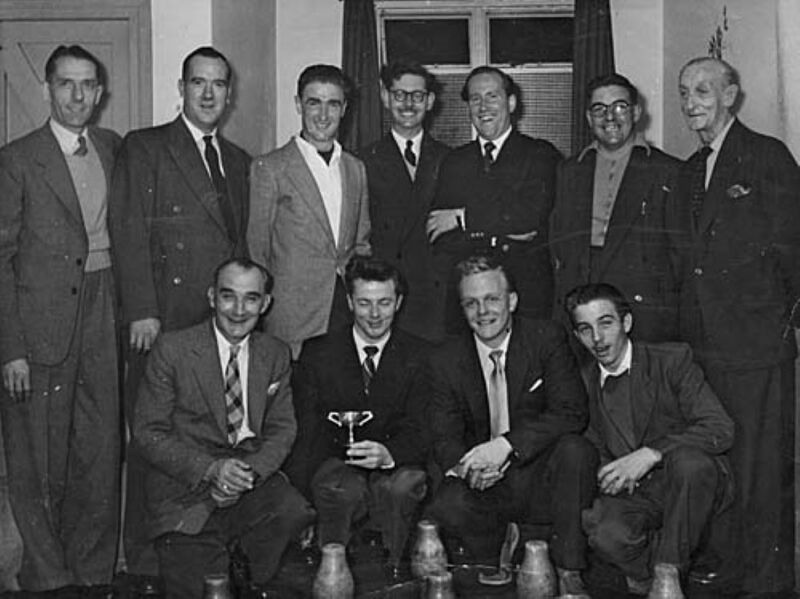 Both Harold Williams of Berkshire Drive, Exeter (the picture of him at his lathe appears in the section on Wheels & Gears) and George Commins tell us about the Sand Rats Skittles Team who were at one time in the early 1950s the League Champions - it is believed that the photograph was taken at the Prince Albert in Cowick Street (now The Showman). 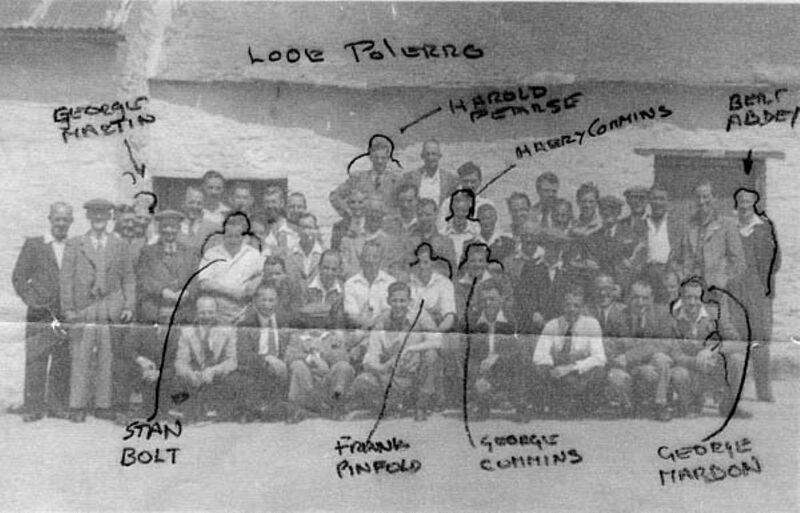 At the time the Captain was George Tozer (pattern maker), Fred Thorn (pattern maker), Tony Clark (electrician), Harry Wood (pipe fitter), Dennis Drew (foundry), P. Tucker (foundry), Harold Williams (machine shop) & John Heard (machine shop).There was also a Darts Team in the Exeter Sports League, a regular Cricket Team (no details but I believe my Uncle Alec was involved). 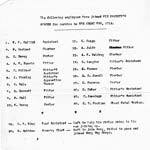 There was also a football team - the only member of the team that George Commins recalls was that of his Dad, Harry! 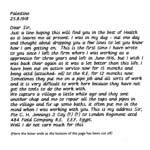 You can see that there are gaping holes relating to the Social Side of the busines - any information that can add to this Chapter would be gratefully received - either documents, photographs or, particularly, memories - you don't have to write to me, you can phone or email - see the "More About Me Section" ! 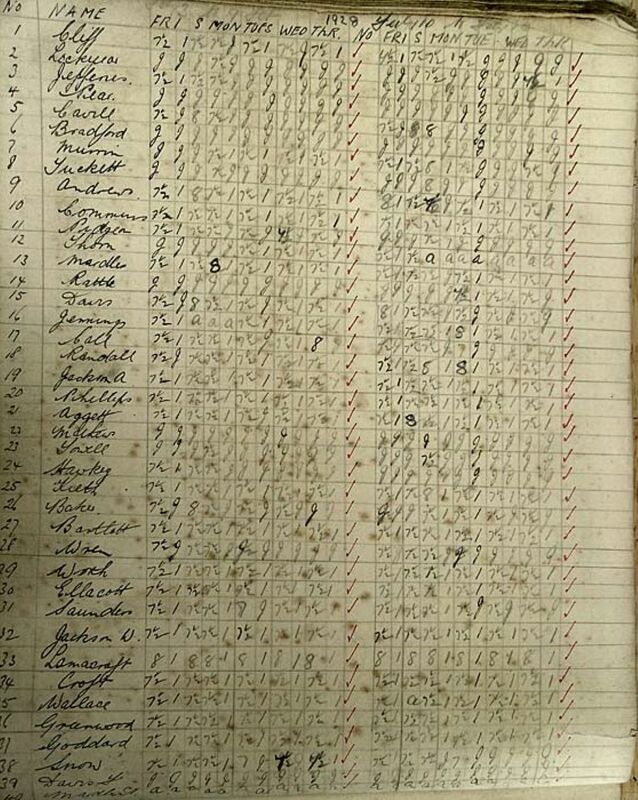 Trewman's Exeter Flying Post for the 5th September 1850. 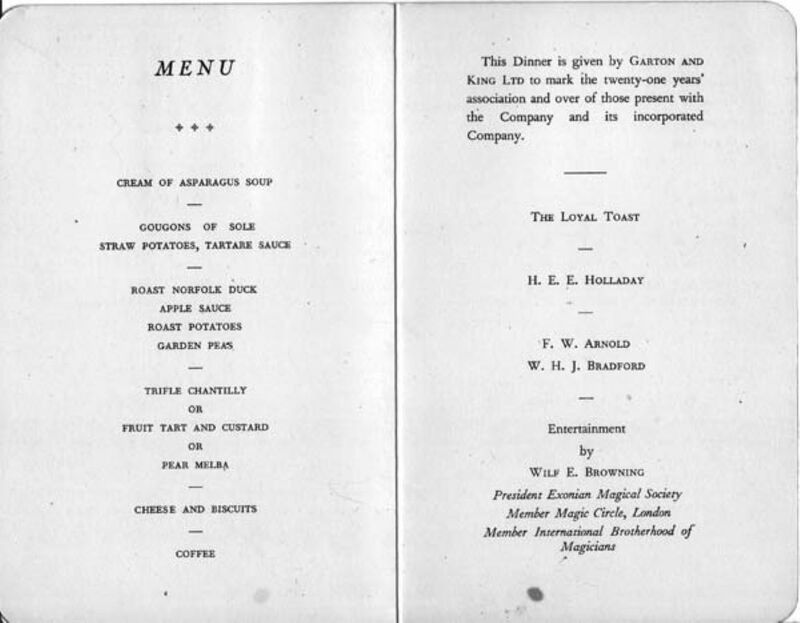 Dinner at the Imperial Hotel, Exeter.Menu Names in photo. Works Day Trip to Looe & Polperro.